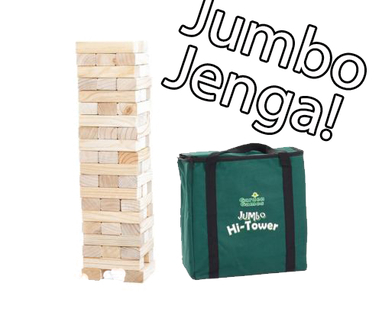 Entertain your guest with this jumbo Jenga. A giant version of the fun traditional family tabletop stacking game, made from solid pine wood. Based on the popular game of Jenga, the game consists of 58 smooth, solid wooden blocks which stack to form a tower starting at 0.6m tall and reaching a height of up to 1.56m in play. Build the tower and then take turns to remove a piece without making the whole tower tumble. The winner is the last person to remove a piece and replace it on the top of the tower, leaving the whole tower standing. This size of the tower is ideal for children as well as adults and is suitable for playing indoors and out. Perfect for BBQ's, parties, family gatherings or just a little fun in the garden.